I am really glad it is Friday because man alive have I had a hectic week. It felt like I hardly touched ground for a few days. Luckily my car is in for a service today so I have an excuse to not go anywhere. Not that it means I don’t have a 100 things on my to-do list today. I hope you have had a gorgeous week and an even better weekend! Right onto the nail art. 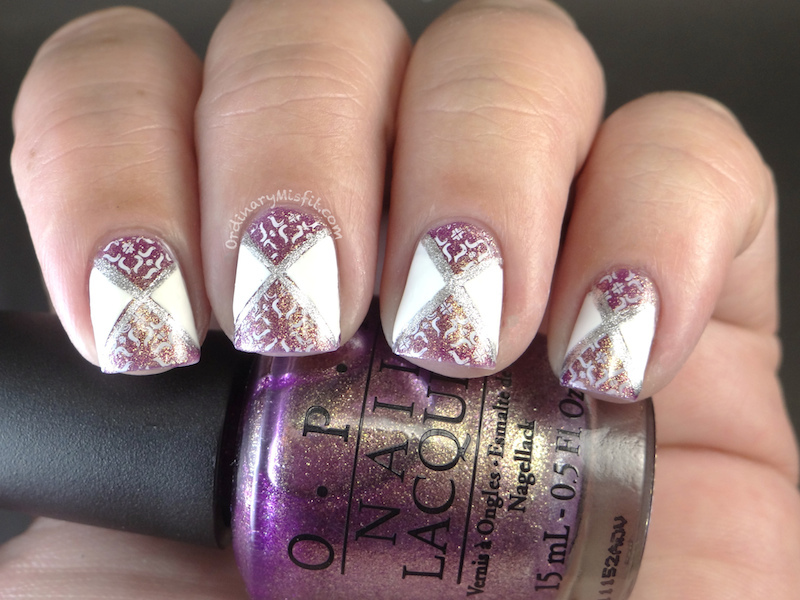 I have some diagonal nail art to show you today that I am a little iffy about. I love the concept but I am not sure if my implementation worked so well. I saw this on Lucy’s Stash and followed her tutorial loosely. In hindsight I should’ve used different polish even though the one I did use was gorgeous. I am just not sure if it works for this. Let me show you. It’s my year is a red purple base packed with golden shimmer. It is really quite gorgeous and exceeded my expectations. It looks pretty in the bottle but nothing compared to on the nail. I only used 2 coats here and even though it was pretty opaque I would’ve used 3 coats if I was wearing it on it’s own. Formula was great and very easy to work with. The original tutorial I followed did the silver lines with striping tape, so if you are not comfortable with, or don’t have a silver striper you can stick with the striping tape as well. I think I should do it this way in future as well. What do you think? Easier to read? What do you think? Did I completely ruin the look or does it at least look a little similar? If I had to redo this I would probably use a plain creme for the base and most likely a colour that is a bit brighter. Let me know what you think or if this is something you would try. I hope you have a beautiful weekend. I know I have a lot of polish stuff to play with so I am going to relax and have fun. Well that is the plan at least, it could all change before tomorrow 😉 If you are in the Durban area (or if you are willing to travel to Durban) then don’t forget the Durban Polish Party. There are some amazing treats coming in to spoil everyone with. Book your seats now as they are filling up fast! I love the OPI colour, it’s so stunning! I think your nails look great! Love this mani, looks amazing! Wow, I think this looks SO gorgeous! And I love It’s My Year! Thanks so much Kerry. It’s My Year is gorgeous. I put off using it because it didn’t look as amazing in the bottle but wow! Oh wow, this is GORGEOUS. But you skipped a step in the tutorial – do you do the silver stripes and then the white, or the other way round? SheBee recently posted…Diabetic. Obese. Trying to do something about it. You’re right! I am going to go back and edit the post as well BUT I did the white first with normal tape and then when the tape came off I did the silver stripe. The tutorial I saw though used striping tape and made the silver lines with striping tape as well. Wow it’s gorgeous! Us mere mortals are supposed to do this? That OPI looks amazing on you! Yes, as gorgeous as the polish is, it’s perhaps just a bit too busy for this. I am definitely trying it again (soon) with other colours. Lol Heather nailed describing this! It totally looks like a Medieval dress! I’m going to be that horrible peanut in the packet, I’m sorry! I don’t like It’s my Year. The gold actually puts me off! The mani is awesome though! Would love to try this over a creme! Hahaha not horrible, the good thing is we don’t all have to love the same stuff 😉 I think the gold is too much for this look. This is the first time i have read your blog! I haev chatted to you on Twitter and somehow missed that you had a blog! I will be a regular reader from now on! Awww you are so sweet. Thank you so much.